"The nineteenth-century American civil engineer, John A. Roebling, is best remembered for his crowning work, Brooklyn Bridge, built to his design by his son, Washington, following the elder Roebling's death in 1869. Although an engineering monument of the highest order, Brooklyn Bridge must--if historical justice is to be done--share its notoriety with a small, relatively obscure suspension bridge that was Roebling's third work, and is his earliest still standing." John Roebling built four suspension aqueducts for the Delaware and Hudson Canal Company as an improvement to the original canal design. His suspension aqueduct built just below the mouth of the Lackawaxen River bridges the Delaware River and is still in use today as a toll bridge as it is the only crossing of the Delaware River for 15 miles. This book contains John Roeblings drawings for the bridge along with descriptions regarding the construction of the aqueduct. A extremely well built design considering that the bridge/aqueduct put into service in 1851 is still standing and providing service some 150+ years later! The Delaware and Hudson Canal Skirted ghostly swamps, crossed stone arch bridges and suspension aqueducts, wound along the base of towering cliffs and clung to the edge of narrow defiles. It followed a route that challenged the engineering genius of its day. 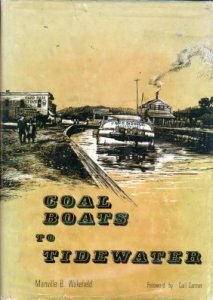 "Coal Boats to Tidewater" is a study in depth of regions clarified by more than thirty maps and over two hundred photographs. This researching and penetrating, graphic an literary record, is not only of the great days of boating and gravity railroading, but of the gaunt skeletal remains of today. It documents the lock ruins and the present day canal-side structures for those who walk the towpaths of the future and like to search out the weed-grown folkways of the past. 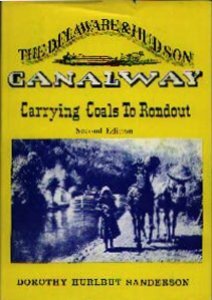 This book is the definitive book on the canal from which our favorite railroad got its name. It includes many photographs as well as superb maps and illustrations by the author. Eighth printing, now includes color photo on front, index and biography of author, many black & white photographs, maps, and line drawings by author. If you own one book on the D & H canal this is the one! Publisher: The Stourbridge Lion Sesquicentennial Corporation, Honesdale, Pennsylvania, 1979, 78-68918. Contains many black & white photographs not previously published, 75 page paperback. The ONLY book on these two gravity railroads in print!